Aquarian Goldfish food are nutritious flakes that have been scientifically proven to help you to keep healthy and lively fish. Suitable for all common and fancy varieties of goldfish, simply feed twice a day as a complete diet. Feed only as much as your fish can eat within 5 minutes. Always used this for my fish, never had any problems, would definitly recommend. Fish like it, doesn't pollute the water as far as I can see. 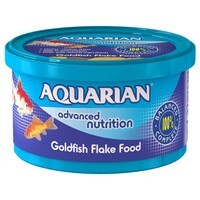 I use Aquarian food for both our Goldfish and tropical fish.